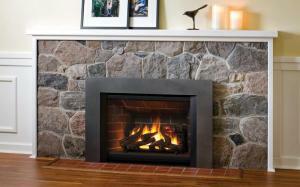 With natural gas, you don’t have to worry about creosote build-up or chimney fires. Operation is safe, clean, and simple. No popping coals, ashes, or sparks. Not only do you avoid the preparation of hauling, chopping, and stacking wood, you no longer have to clean up. Even if you have only the last hour of the day to relax, you can enjoy the warmth and beauty of a fire and switch it off when you are ready to turn in. Masonry fireplaces are 10 to 25 percent efficient, compared with efficiencies as high as 80 percent for natural gas fireplaces. Heat the room you live in most for about $0.50 an hour, and turn down the thermostat in the outer rooms. No need to change out your current heating system. If you aren’t already convinced on the money saving delights of gas fireplaces, you should also consider the awesome rebates currently being offered by Energy Trust of Oregon to those who install their equipment by December 31st. The gas fireplaces must meet efficiency standards approved by the cash incentive program, but you can find a complete list of qualifying fireplace models as well as information on claiming your rebate here. So, contact us today and we will help you get started on this home and heart warming adventure.